Posted on 4/12/2019, 9:38 am, by rackycoo, under General Projects. 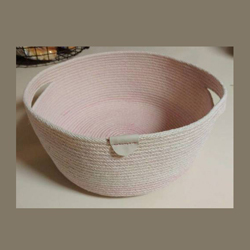 This weekend, grab a cotton clothesline, pull out your sewing machine, and make a rope basket. tendstowardschaos used several shades of pink thread to give hers some subtle color. Beautiful and useful!